I’m excited to release the Audience Explorer dashboard — a free, easy-to-use analytics tool for small and medium-sized publishers that puts loyal, engaged users front-and-center to drive journalistic impact — and publisher revenue. 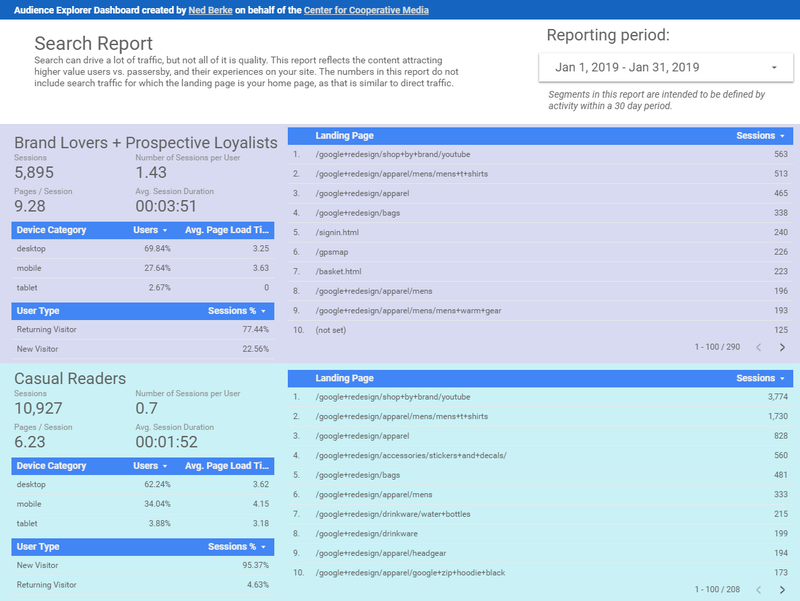 The Audience Explorer is a set of 10 reports that drills into Google Analytics to specifically pull the kind of data publishers need to grow a relationship with their loyal and potentially-loyal readers. It provides side-by-side views of three different segments of readers, the content that resonates, and the platforms driving engagement with your website. As any publisher knows, it’s easy to get buried in data and not have a clear picture of what’s important when you’re parsing analytics. 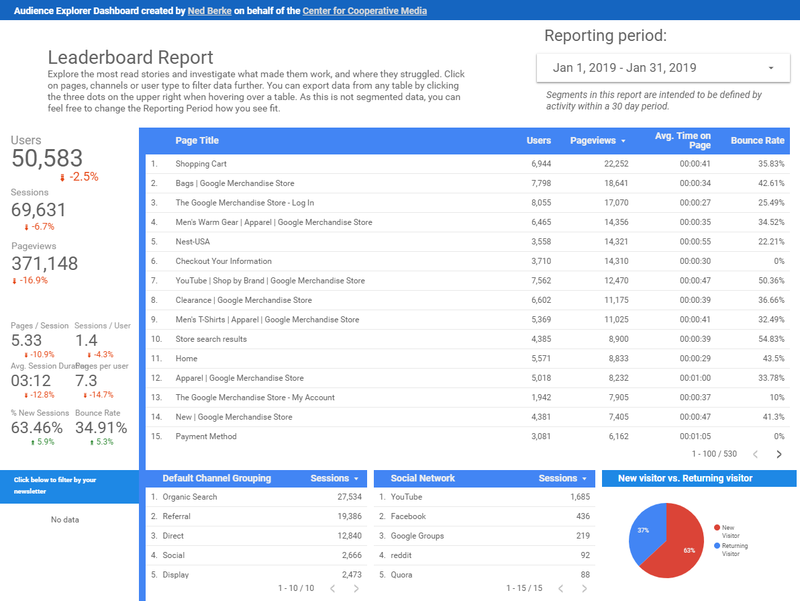 Using these reports, publishing teams can filter out the noise of extraneous data in Google Analytics, and develop insights about the tactics and strategies that turn passersby into daily readers. In essence, Audience Explorer will help you understand and build an audience funnel. 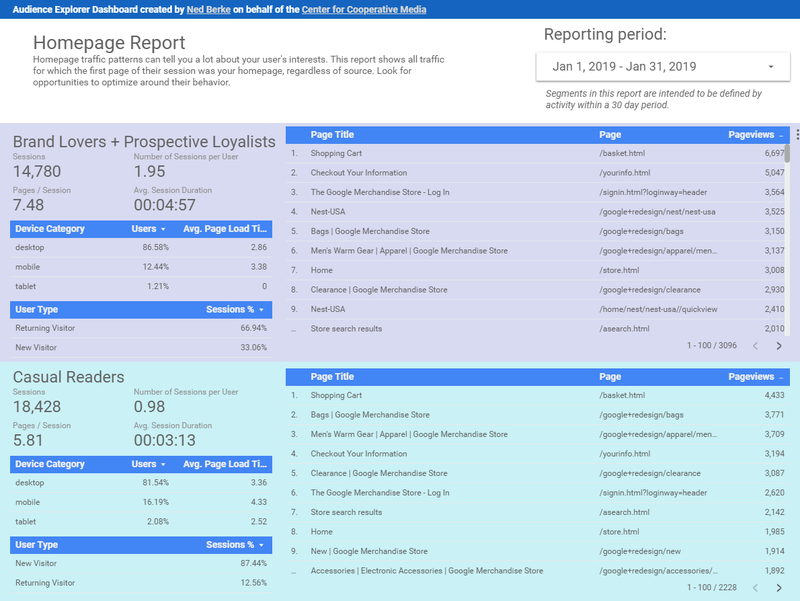 The dashboard includes three additional reports that publishers may find useful to understand their overall audience, and the performance of individual content and acquisition channels. This post explains how publishers can integrate the Audience Explorer into their workflow, beginning with the thinking that went into its creation and eventually explaining how to use each report within the dashboard. It concludes with a Google Sheets template publishers can copy to track their performance in key metrics each month. The Audience Explorer is created for the Center for Cooperative Media as part of the Audience Development Fundamentals program, which is supported by the Knight Foundation. The tool was also developed in partnership with the Local Independent Online News (LION) Publishers association and its RAMP program, with additional support and guidance from The Hechinger Report. 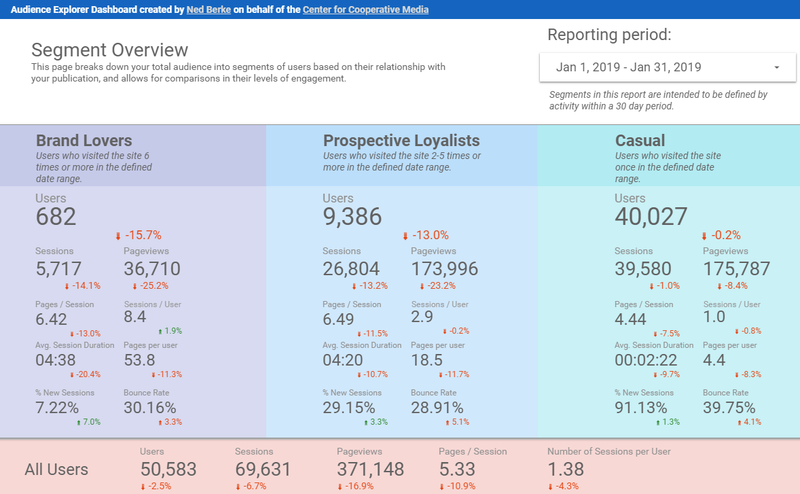 It is modeled after the News Consumer Insights dashboard created by the Google News Initiative. The Audience Explorer breaks down key Google Analytics data by three categories of users — known as segments — defined by their relationship to your website. These segments — Casual Visitors, Prospective Loyalists and Brand Lovers — comprise a basic funnel. Here’s how that funnel works. Casual Visitors are aware of your publication, visiting no more than once per month. As their interest in your coverage increases (perhaps because you do great coverage, or do a better job distributing it — or both), they move down the funnel to become Prospective Loyalists. These visitors are much more engaged with your site, visiting two to five times each month. On average, they consume more pages per session as well. And as they find more that they love, your publication becomes an indispensable part of their routine and they visit six or more times a month. At that point they are considered Brand Lovers — in many cases, this is less than 10 percent of your audience yet drives up to 60 percent of pageviews each month. You can install these custom segments in your Analytics. Here’s how those segments are named in Google Analytics and defined. They’re meant to be used in roughly 30-day timeframes (calendar month is fine). [CCM] Casual Visitors— Users who visited your site once in the timeframe explored by the dashboard. 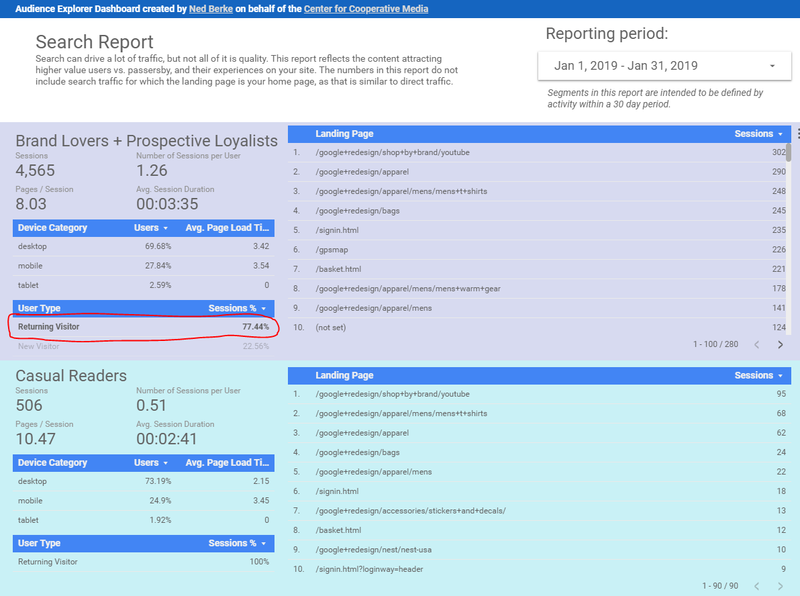 [CCM] Prospective Loyalists — Users who visited your site between two and five times in the timeframe explored by the dashboard. [CCM] Brand Lovers — Users who visited your site six or more times in the timeframe explored by the dashboard. Your goal is to move people from Casual Visitor to Brand Lover. Brand Lovers are what make digital media businesses successful. They read your stories, send you news tips, evangelize your work, leave comments and attend your events. They drive the most reliable pageviews that underpin your advertising, and open up their wallets for membership and subscription programs. How do you move them along? Unfortunately, no dashboard is going to give you definitive answers you need to serve your unique audience. Data needs to be interrogated, and the Audience Explorer makes it ripe for questioning. Use the reports in Audience Explorer to better understand your best readers, the content they engage with and the channels they most prefer. From there, develop hypotheses about your content, distribution, site design and user experience, then make a plan and use the reports to measure results. Here’s a Google Doc with detailed instructions. It takes about 20 minutes to get it up and running, and up to an hour to configure some of the optional reports (depending on your familiarity writing filter rules, it can be shorter or longer). Many dimensions in the dashboard can be clicked on to further filter the information of the page your viewing. These can show you a narrower slice of the activity you are analyzing. In most cases these are not labeled as filters, but I note them in the descriptions of each report below. Here is an example. This example is from the Search Report. I’ve clicked on Returning Visitor, and now it is only showing me the data for traffic from visitors already familiar with the website. To remove the filter, I’d click on Returning Visitor again. Filters do not carry from page to page. 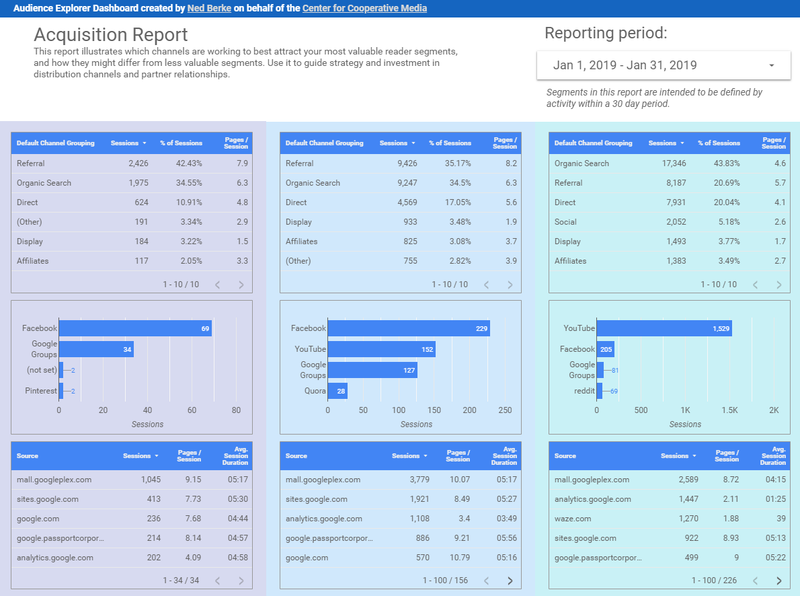 Any table in a Google Data Studio dashboard can be exported to a spreadsheet or explored further in Data Studio. Look for the three dots on the top right of any table when hovering over it with the mouse. 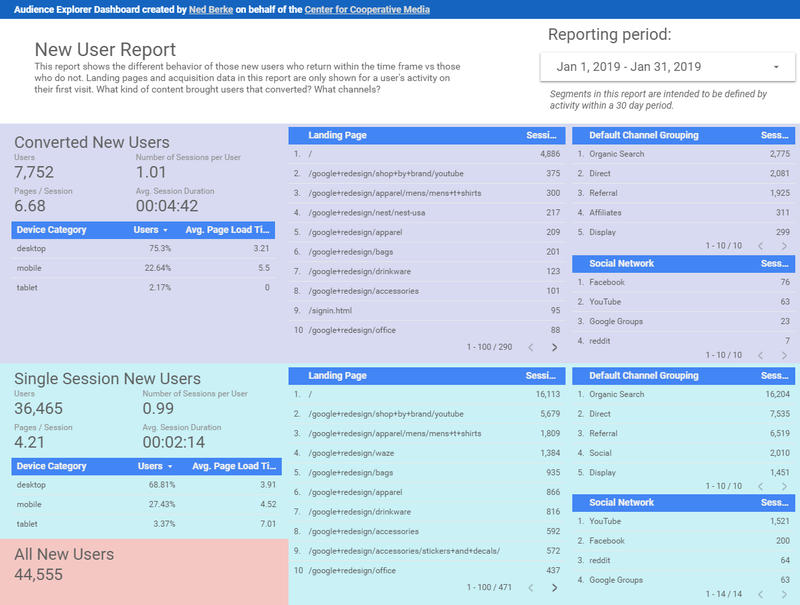 Google Data Studio is painfully slow when connected to Google Analytics, especially in a dashboard with as many pages and reports as the Audience Explorer. 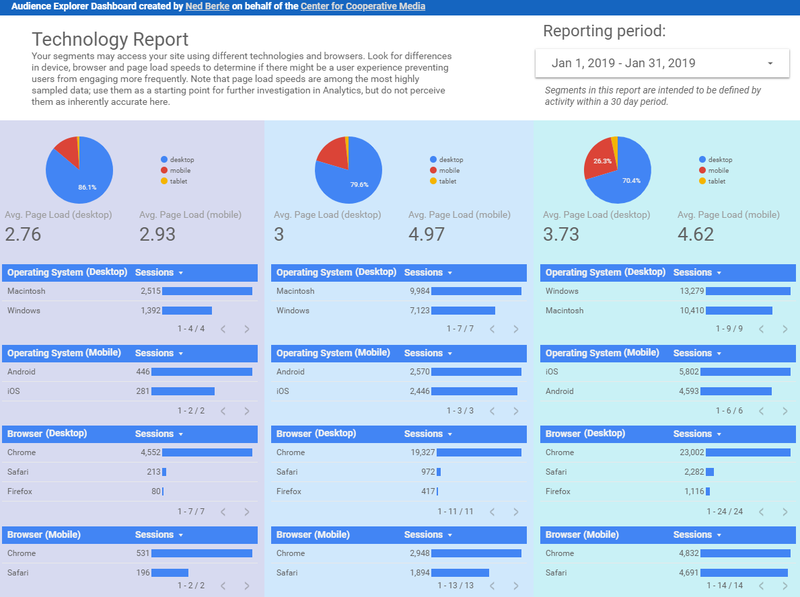 If you have a large site, you may need to turn each page into its own Data Studio dashboard in order to reduce load speed. This is the snapshot of your audience breakdown, showing you the amount of users in each segment and their relative engagement numbers. The higher quality of Brand Lovers and Prospective Loyalists over Casual Visitors should be immediately obvious — high pageviews per user, longer time on site and lower bounce rates. Note that the sample data in my snapshots are not from a news publication, so don’t use it to draw comparisons to your own audience. What pages are your segments visiting? 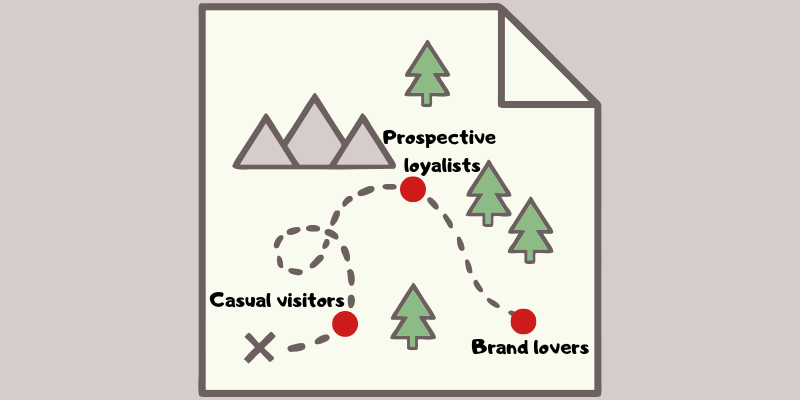 Do your Brand Lovers have different interests than your Casual Visitors? Can you grow that base by offering them more of that? At the end of the report is a variant of this page, for which each segment has two content tables — one with filters applied just to see article content, the other with filters to see everything except article content. This can provide a much more thorough view of how your best users use your site, but it requires additional setup as detailed in the instructions. How do your best users find your site, and how do individual distribution channels deliver on engaged audiences? This report breaks down each segment by Google Analytics Default Channel Grouping, social network and referrer. The next three reports — Search, Facebook and Twitter — provide a deeper look at traffic from each of these platforms. The table reveals the landing page — which is the first page to which a user arrives. This gives you a good idea of the what content attracted people from that specific platform. The Device Category and User Type serve as additional filters on this page, allowing you to see the different behaviors for mobile vs desktop, or new vs returning. This report shows all traffic for which the first page of a user’s visit is the homepage. This audience is very valuable because the majority of them will have come direct, or by typing your site’s name into a Google Search (intent-wise, the same as direct), and they likely have a high percentage of Brand Lovers. What do they read after the homepage? What kinds of devices are they on? Does that affect their behavior? Again, Device Category and User Type are filters. The Newsletter Report requires additional setup to identify the traffic that comes specifically from your newsletter (and not all email traffic). Instructions are provided in the documentation. Like the Homepage Report, the Newsletter Report shows you a very valuable slice of readership. It’s worth the extra steps to set up. Use this report to learn more about your audience’s demographics, location and interests. My understanding of Google Analytics demographic and interest data is that it’s highly sampled, which could mean less accuracy for small publishers — so take information here with a grain of salt. Still, anything that stands out might merit investigation. Everything on this page, including the map, is a filter. Learn more about the technology your most valuable segments are using. This report can sometimes provide a critical insight into user experience issues. For example, if your Casual Visitors are overwhelmingly mobile but your high value segments are overwhelmingly desktop, it’s quite possible you have a bad mobile experience and people aren’t returning to it. Similar discrepancies in device, operating system and browser could reflect other issues. Everything on this page, except page load speeds, is a filter. The following three reports aren’t segment based, but are built at the request of, and with feedback from, several small publishers. Some may find them the most actionable part of this dashboard. Because they’re not segment based, you’re no longer tied to viewing the data through a 30-day (or calendar month) time frame. There are a lot of reasons a user might visit your site for the first time and never come back. A fairly typical example is someone doing a Google Search for a highly specific question, lands on your site, gets the answer, and moves on with their life. That user was never going to be a Brand Lover, so we may have no need for strategies that result in this segment growing. New visitors who do come back, however, are primed for more analysis. They’ll start out as Casual or Prospective, and can make great candidates for Brand Lovers. These are Converted New Users — a person who visits your site for the first time and then makes at least one more visit within the month. Knowing the pages they’re landing on and the channels sending them can be very helpful to guiding your growth effort. 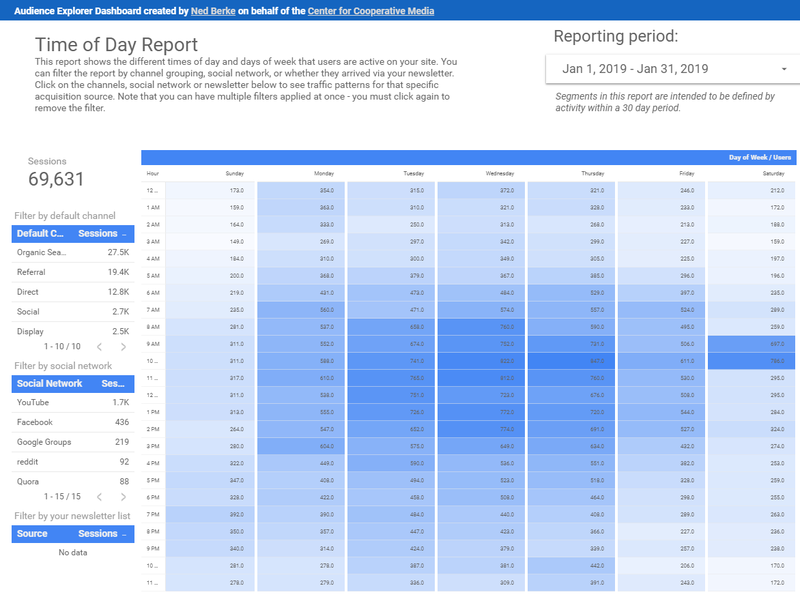 This handy report shows what days of week and time of day your users come to your site. Everything in the left column is a filter, allowing you to see different traffic patterns based on acquisition channel. Use this to inform decisions about your deadlines and publishing schedule on your site, social media and newsletter (you’ll need to have configured the Newsletter Report to use the newsletter filter). This is a publisher favorite. It shows the most viewed content on your site in the time frame you choose, as well as acquisition and engagement data. Every page in the table, acquisition channel, and user type is a filter. So if you have a breakout story, you can click the title and see what channels are driving traffic (and the quality of that traffic). Or you can choose a social network or your newsletter and see the content that’s resonating there. Once you’ve hit that copy button, this report is yours to do as you see fit. Add or remove metrics from the tables, or create tables that reflect the data you most want to see. Data Studio looks intimidating, but it’s fairly intuitive once you get going. It has good documentation, and most things can be boiled down to components and properties. If I can do this — and this was my first project in Data Studio (or any data visualization program, for that matter) — you can, too. One way to really unlock the power of your analytic is to add custom dimensions. This brings data into Analytics like whether the user is logged in or not, as well as the author, category, tags, word count, etc., of the stories they’re looking at. You can see how your authors and categories resonate with specific segments, or if your Brand Lovers prefer longer or shorter articles. Creating custom dimensions can require additional coding. Read more here. However, if you use a popular CMS like Wordpress, there are plugins and extensions that can make it easier. Finally, it needs to be said that looking at these reports on any given day is not going to provide many meaningful insights. The full power of this report is unlocked by watching how the metrics change over time, particularly in response to the strategic decision you make. This will be how you know if you are on track to grow your Brand Lovers as you choose to focus more on Twitter, or deepen coverage on a specific beat, or redesign the article page to have more email signup forms — or any of the other decisions publishers make every day. 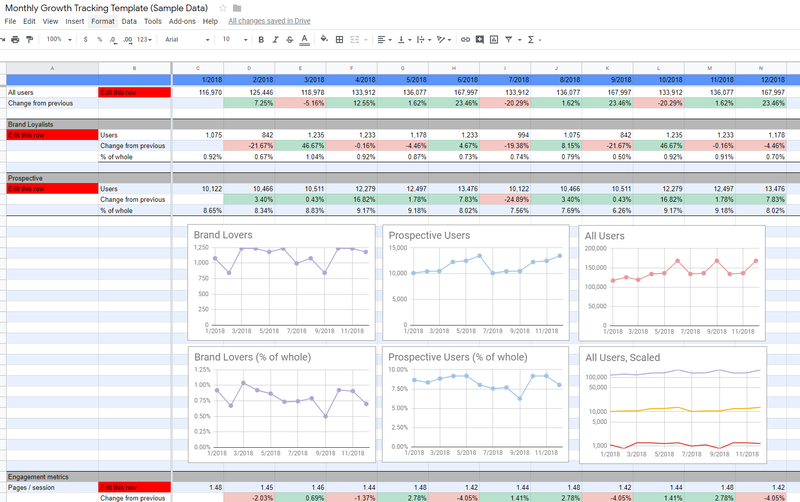 I’ve built a Google Sheets template for monthly tracking of Audience Explorer metrics to copy and adapt as they see fit. By default it asks you to take less than an hour every month to input a few data points — such as your number of unique users in your most important segments, and some engagement metrics. Formulas in the spreadsheet will perform a few calculations and generate basic charts that help visualize your growth. This will give you a good overview of the efficacy of your strategy, and allow you to focus on the what you love — creating fantastic content that engages readers who support your work. P.S. Follow me on Twitter and LinkedIn, and don’t hesitate to reach out with questions, bugs, or just need a helping hand installing or understanding the Audience Explorer. 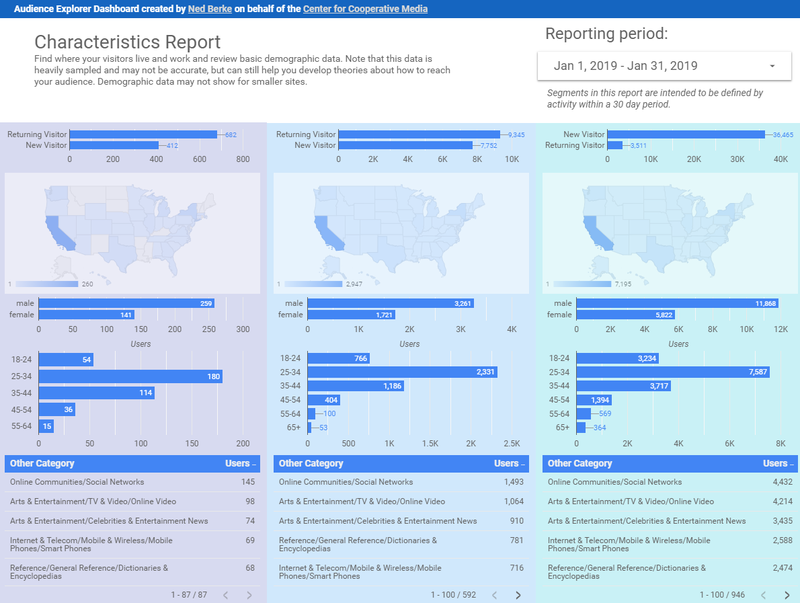 The Audience Explorer dashboard was created by Ned Berke for the Center for Cooperative Media as part of its Audience Development Fundamentals program, which is supported by the Knight Foundation. The tool was also developed in partnership with the Local Independent Online News (LION) Publishers association and its RAMP program, with additional support and guidance from The Hechinger Report. 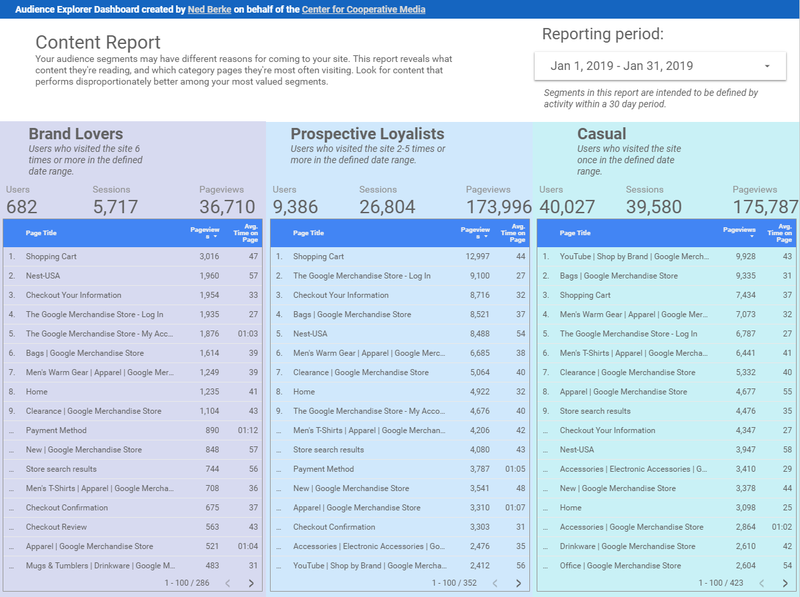 It is modeled after the News Consumer Insights dashboard created by the Google News Initiative.